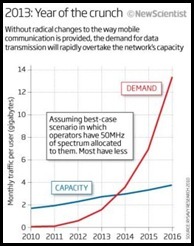 Article in this weeks New Scientist about the capacity crunch across mobile networks due to the incredible surge in demand for mobile data, in particular video. If network capacity remains as is and the projections are on track, some time in 2013 is the date when the wireless networks collapse under their own weight. The author examines four different solutions that the wireless carriers could use to address this issue. Get rid of “unlimited data” plans. When something is perceived as free, it tends to get used a lot (cf. the internet). This solution is already being deployed by AT&T for new iPhone 4 users. Increased bandwidth available to carriers. 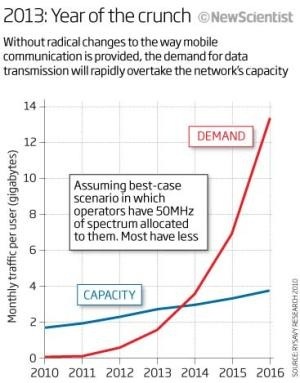 While this seems feasible, it is highly political and spectrum auctions are viewed by governments as very welcome ‘new’ sources of revenue (so very expensive). Plus doubling the bandwidth will delay the crunch for maybe two years. Deploy 4G technologies, such as LTE and WiMAX, unfortunately while these promise greater speeds, the uplift in capacity is only 50% over 3G, which just delays the inevitable one year. Given the ‘go slow’ mentality of most carriers when it comes to 4G, I seriously doubt if 4G will be deployed except in major cities until well after 2013. This entry was posted in Business Model, Consumer Electronics, mobile phones, Telecom and tagged Android, apps, femtocells, mobile networks, mobile phones by geoff. Bookmark the permalink.